American Death Thrash is a split CD that came out on HPGD Productions last year. And although the HPGD releases may sometimes seem just too “weird” and sick, I was surprised not to see many features about this particularly excellent split CD. Here’s one thing I’ll keep on repeating like an old fart every time I’ll tell you about a split CD: I love this format, and there are 3 major reasons for that. First: it’s a nice opportunity for bands to release new or alternative material that didn’t fit on any of their regular albums. Second: it’s a fantastic way to discover new bands featured with more established ones. Third: I just love the “compilation” idea and the “battle” between two bands. I knew very little about Sacrificial Slaugter before listening to American Death Thrash. The guys hail from Southern California and they have already released 2 LPs in the past ten years. Their sound is harsh, fast and very “Thrash Metal”. In fact they play exactly…Death/Thrash Metal! The powerful riffs are extremely sharp and the musicianship is very tight. They actually sound a bit like Scandinavian bands, with an epic edge to all of their songs. But the permanent groove that naturally flows out of their songs also makes them typically American. Sacrifical Slaughter really came up with heavy and epic stuff on their side, with outstanding lead guitars by Nekro Nick. That first side is concluded with one of their best tracks: “Acid Reflux”. Also note that this is the first material they release since their 2009 LP “Spontaneous Suicide”; and it perfectly incarnates the Split-CD title: “American Death Thrash”. 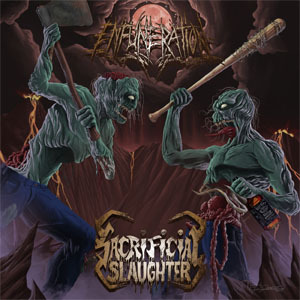 The second band featured on American Death Thrash is newcomer Enfuneration. And trust me, they won’t stay newcomers for long. The band hails from Oklahoma City and this is the first official material they ever release (they released a 35 minute demo in 2008 though). And man that stuff is good! Enfuneration plays classic Death Metal in its best form: heavy, epic, mystical and totally old-school. What I love about old-school Death Metal is that it’s always been about writing actual SONGS. It never was about having a speed or technique contest. And Enfunration sure can compose some fine songs, full of melodies, dynamics and cool hooks. And what struck me even more is their ability to mark their territory and impose their style with only a few songs. I know a lot of more established bands that would sell their soul to be able to write such mature and strong songs. I was impressed with that young band, really, as there are some epic songs here like “Bearing Their Scars” or “Grieving Process Denied”. They actually reminded me of The Chasm, the fantastic occult Black/Death Metal band from Mexico. Amercian Death Thrash is a really cool release that perfectly fills the split-CD missions: Sacrifical Slaughter get to release their first stuff in 2 years, and you guys will probably discover the awesome Enfuneration. Definitely a release you need to support, because the only winner of that “battle” is the “metalhead” that’s getting 42 minutes of great Metal!